The Philharmonic, on Hope Street, Liverpool has been the center of England's cultural life for over 150 years. 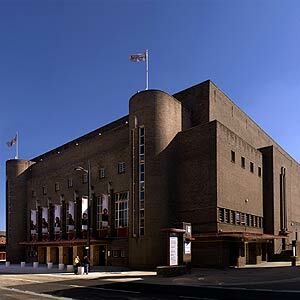 The Liverpool Philharmonic is an exquisitely built art deco hall, which hosts more than 250 concerts, films and other cultural fiestas in a year. The hall, financed by a group of music-loving amateurs was first opened on 27th August 1849. Designed by John Cunningham, it was built in true Victorian style, with a box-shaped auditorium, large, grand stalls and a number of balcony seats. The Philharmonic hall in Liverpool had gone through a disastrous fire in the year 1933. The present art deco hall was designed by architect Herbert Rowse and reopened in 1939. Art Deco is an architectural style of the period 1925-1940, characterized by geometric designs, bold colors, and the use of plastic and glass. The Philharmonic hall in Liverpool underwent further refurbishment in 1995 with a whopping budget of ?10.3 million. The Philharmonic hall has an illustrious past and has been graced with the performances of legendary conductors like Sir Thomas Beecham, Max Bruch, Sir Malcolm Sargent. The Liverpool Philharmonic hall has also seen the likes of modern age musicians like The Beatles, The Rolling Stones and Buddy Holly. For musicians all over the world, the Liverpool Philharmonic is the Mecca of music and performing there would be their long cherished dream. The Liverpool Philharmonic is home to the world-renowned Royal Liverpool Philharmonic Orchestra, one of the world's oldest concert orchestras, which gives over 80 concerts a year. Moreover it is the only orchestral society in Britain to own and operate within its own hall. The Liverpool Philharmonic is one of the few listed heritage sites of the United Nations and its acoustics are considered to be among the finest in Europe. Choral music filled the hall during and just after World War I because of the scarcity of orchestral musicians. The Philharmonic hall is one of the most famous Beatles haunts, as Liverpool was their hometown. Liverpool has a considerable Jewish population, which has influenced the music of the orchestra.